Hot German potato salad first started appearing in cookbooks back in the 1940s, and now it's making a comeback! Adapted for flavor, ease, and time, this recipe is made in your pressure cooker instead of three different pots on the stove. This dish works great as a side, main dish, or even for breakfast with an egg on top. 8 Russet potatoes, scrubbed and cut into 1-inch cubes. Working in batches, cook bacon in pressure cooker set to Sauté on Normal (medium) until crisped, about 4 minutes per batch. Press Cancel and remove bacon to a paper towel-lined plate. Chop bacon when cool. Drain fat from pot and return to pressure cooker base. Whisk vinegar, water, sugar, mustard, parsley, salt, and ground black pepper together in a bowl. 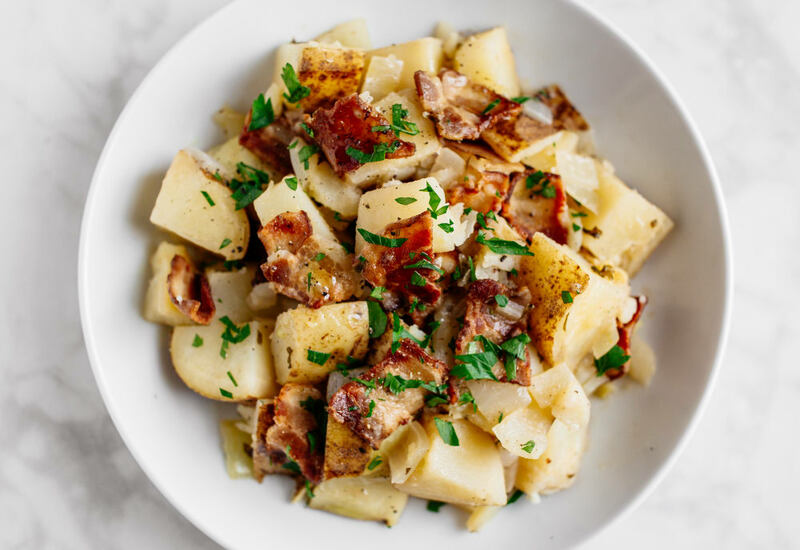 Place chopped bacon, potatoes, and onions in pressure cooker pot and pour vinegar mixture over the top. Lock pressure cooker lid in place and turn steam vent handle to Sealing. Select Pressure Cook (manual) and cook on High for 6 minutes. Turn steam vent handle to Venting to quick-release pressure. Transfer potato salad to a serving bowl and garnish with fresh parsley. Serve hot. Want less salt? Substitute Trocomare (an herb-infused low-salt compound with loads of flavor). No sugar in your diet? No problem! Substitute agave syrup. Per Serving: 330 calories; 5g fat; 61.2g carbohydrates; 11g protein; 11mg cholesterol; 696mg sodium. Nice and vinegar-y potato salad. Just how I like it. I made one with the sugar added for family and did another batch later on for my Whole30 month. I took a tiny bite of the one with sugar and yes, it does help cut down a little bit of the vinegar flavor, however I still enjoyed my version. I used dijon mustard that I had on hand, but will try honey mustard next. This was delicious! I made it as a side with pressure cooker BBQ ribs (also from this site). I subbed dill for parsley, because I prefer dill. It was easy to make and tasted great. Delicious! I stirred in some olive oil and grain mustard at the end to make it a bit more creamy - finished it off perfectly! Did someone say bacon? Such a good potato salad recipe, especially with the honey mustard. I served it for breakfast with an egg on top as suggested. The best part was that it was ready in around 15 or 20 minutes thanks to the quick pressure cooker. Reminded me of my years spent in Germany. Grilled up some bratwurst to go with this and the family loved it.